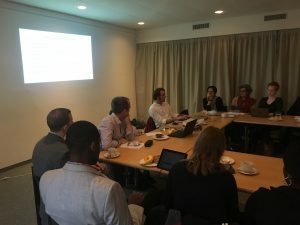 On 15 November, the Quaker United Nations Office (QUNO) and the Global Detention Project (GDP) hosted a briefing and discussion for NGOs, IGOs, and government representatives on the role social media and other new digital technologies play in migration journeys, with a special emphasis on their use in the context of detention and migration control in North Africa and the Mediterranean. Since the “refugee crisis” exploded across the international media and political landscapes, the role of social media has been repeatedly dissected, argued over, and—more often than not—misunderstood. Although many have presented new digital platforms as security threats that enable traffickers and illicit enterprises, these technologies have also played a critically important role in aiding refugees, asylum seekers, and migrants in need. The event included a discussion of the GDP’s new special series “Physical Fences and Digital Divides.” GDP researcher and investigative journalist Tom Rollins discussed the research behind the series, including his on-the-ground reporting in Egypt and Sicily exploring the diverse ways that migrants and asylum seekers use social media during their journeys. The presentation was followed by an interactive discussion on whether or how new digital technologies can be harnessed in ways that emphasise harm-reduction during migration journeys. More information about the series “Physical Fences and Digital Divides” is available here. This event, which was held at Quaker House in Geneva, is part of a series of events about migration realities planned by QUNO through 2019.